What counts as learning physics? Is it just learning physics concepts and equations? Increasingly, physics education researchers have begun to investigate how attitudes, beliefs, and expectations play into learning. Just as instructors can use tests to determine how much knowledge students gained during a course, researchers can use specially designed tests to track how students’ attitudes change throughout a course. Unfortunately, students in introductory physics courses tend to experience negative attitudinal shifts toward physics. This negative shift has been observed in both traditional (lecture-based) and transformed (active-learning) courses. However, there have been a few instances in the literature where positive attitudinal shifts have been observed, including in Modeling Instruction classes taught by the authors of today’s paper. Today’s paper investigates which features of the Modeling Instruction curriculum may be responsible for this positive shift. So what is Modeling Instruction? Modeling Instruction is based on the idea that science is the ongoing process of developing a model, validating it, applying it, and revising it. Students in a Modeling Instruction course develop their physics knowledge by constructing models of physical phenomenon through guided activities in small groups. Students then participate in a class discussion to discuss their models and work toward a group consensus of the model before testing their revised model with additional activities. To gauge how Modeling Instruction affects student attitudes about physics, today’s authors administered the CLASS survey (a highly validated survey for student beliefs about physics and learning physics) on the first and last days (essentially a pre- and post-test) of the Modeling Instruction classes. The survey was administered across four years with six different instructors who varied in experience with teaching modeling instruction. Some of the instructors had taught the course for many years and others were teaching it for the first time. To support the new instructors in teaching the course, there was a weekly planning meeting for the course and five of the six instructors regularly attended. After analyzing the results from the CLASS survey, the researchers found that all the instructors showed median attitudinal shifts that were positive (figure 1). Figure 1: Overall attitude shifts for each instructor. The thick line corresponds to the median shift. The box width is scaled by the square root of the number of students (Figure 3 in paper). To better characterize the results, the researchers calculated the effect size of the positive attitudinal shifts for each instructor, which are shown in figure 2. Figure 2: The effect size (measured by Cohen’s D) for each instructor .Effect size is essentially the change measured in terms of the standard deviation (Figure 2 in paper). The effect size is essentially the number of standard deviations the mean has shifted. 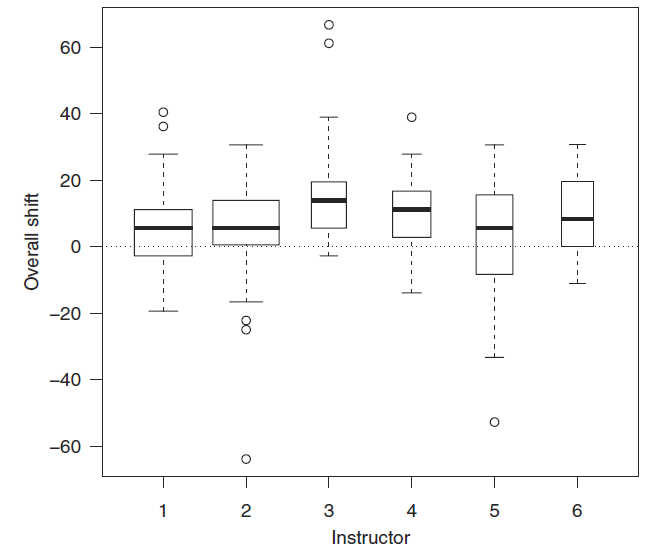 All instructors but one showed effect sizes that were significantly different from zero. Interestingly, the one instructor who didn’t show an effect size different from zero was the only instructor who didn’t regularly attend the weekly planning meetings. When the results from all six instructors are combined, the effect size was 0.45 with a 95% confidence interval of 0.26-0.64, suggesting that Modeling Instruction supports the development of more positive views of learning physics, regardless of the instructor. But why does Modeling Instruction appear to promote more positive views of learning physics? Multiple instructors produced significant increases in positive attitudes so it doesn’t appear that an exceptional instructor is driving the gains. Modeling Instruction does try to promote certain attitudes about learning physics, which could explain why students develop more positive attitudes. However, there is a lack of similar results from other transformed courses, suggesting that this also cannot explain the increase in positive attitudes. The authors note that the small class sizes could explain the results, but there have been few studies of transformed classes with large number of students (≳100 students) to compare with. Finally, the authors note that the CLASS survey used in this study may be measuring more specific traits than just attitudes about physics. The authors specifically mention self-efficacy (one’s belief in their own ability to accomplish a goal), which Modeling Instruction has been shown to shift self-efficacy beliefs positively while traditional lecture-based courses have been shown to shift them negatively. Even if a specific reason for the results cannot yet be determined, we can still ask why the results matter in the first place. Various other studies have shown that attitudes toward math and science are predictors of success in those courses. In addition, attitudes toward physics have been associated with enrolling in physics courses, persisting in a physics major, and conceptual gains. Examining attitudes of students may then be important for increasing enrollment and degree attainment in physics, especially among women and underrepresented minorities. Figures are used under Creative Commons Attribution 3.0 License. Next Post:Can Math Tutorials Improve Physics Grades?